What Is The Definition Of SEO And How Is SEO Done In 2019? The world is connected like never before. An average of 40,000 search queries is entered into Google every second. That’s 3.5 billion searches per day and of those, a total of 2.6 billion are local searches. 2019 | What is the definition of SEO? SEO is an acronym for Search Engine Optimization. SEO is the series of strategic approaches and practices that are implemented to organically generate a high-rank position in the search engine page results of internet search engines like Google, Bing, and Yahoo. The objective of a higher ranking in the SERPs is to increase quality and quantity of the traffic to a site by creating content and resources that are relevant to target audiences searching for particular information–SEO helps businesses get found online. You can also learn about Local SEO for small businesses HERE. How is SEO done and how does SEO work in 2019? The most crucial part of an SEO strategy is a powerful content wheel. Curating content that is powered by research and insight is what drives traffic to a site. Content should be well researched and factual. It should provide enlightenment and insight to people engaging with it. To improve engagement and increasing quality organic traffic, a business must have high-level understanding of what stage of the consumer engagement cycle the content addresses. This facet introduces all the technical changes on a website; ensuring programming and coding is in direct alignment with Google’s search engine best practices. Fixing a website’s backend can be easy or time intensive. It all depends on the scope of the work. Generally, it requires experienced people with highly specialized technical disciplines. This is the part of an SEO strategy that focuses on building quality external referral links that trust a given site as an authority or source in the targeted categories. Simultaneously the internal linking within the site is optimized for ease of navigation to promote a better user experience. Every SEO strategy should have measurable milestones. These metrics provide insight into what’s working and what isn’t. By leveraging these insights SEO strategies can quickly adapt to the changing tides of the internet. When is the best time to invest in SEO? Deciding when to start an SEO program is as simple as answering the following questions. Do I want my business to get found on Google? 70% of consumers click links generated organically. Do I want more leads or traffic to my site? SEO will increase the visibility of your website. I keep getting lots of leads however very few are the kind of leads I want. How do I attract qualified leads? SEO helps by creating a strategy that curates the right kind of content for the right kind of customer. Do I want a cost effective marketing solution that won’t waste my money? 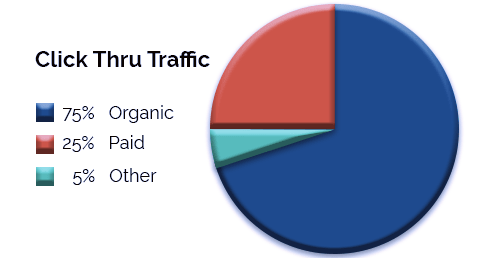 It costs 61% less to generate inbound links with an organic search strategy. Have more questions about search engine optimization? Contact us. today!